Even meat lovers can't get enough of this deliciously healthy food. Have you tried jackfruit yet? If not, do you even know what it is? It’s a healthy vegan meat replacement and it’s becoming one of the biggest food trends among vegetarians, vegans and even adventurous meat lovers. 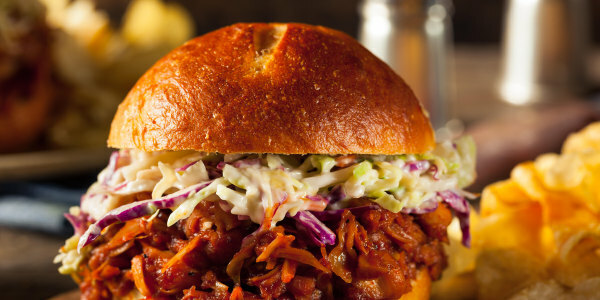 Best of all, it's the key to making an insanely delicious barbecue pulled 'pork' sandwich that you won't believe is vegan. A relative of figs and breadfruit, jackfruit grows in tropical areas of Southeast Asia, Brazil and Africa. While it is technically a fruit, its consistency is similar to that of chicken or pork. It has a fairly neutral taste when young, so it takes on the flavor of whatever sauce or seasoning you pair it with. It has a stringy consistency that works especially well with tangy barbecue sauce to make a vegan BBQ pulled 'pork' sandwich. Unlike animal sources of protein, jackfruit contains no saturated fat or cholesterol, it's light in sodium, and is also low in calories, with just 20 per a 2.65-ounce serving. Additionally, jackfruit contains 3 grams of fiber per serving, as well as 110 milligrams of potassium, heart-healthy nutrients that many of us are not getting enough of. Last year may have been the “Year of the Vegan.” Products that I couldn’t have imagined a few years ago, like vegan beef jerky and seitan bacon, are hugely popular today and are showing up in the grocery carts of committed vegans and meat eaters alike thanks to their health profile. In fact, sales of meat alternatives rose from $69 million in 2011 to $109 million in 2015. As to whether jackfruit is an amazing protein source like real meat, the answer is “meh.” The seeds of the jackfruit are rich in protein, but the fruit itself is not. A 2.65-ounce serving has just 1 gram of protein, compared with 21 grams found in the same amount of chicken breast. You can also buy jackfruit seed flour to bake with, but it’s still quite hard to find. The first thing to know about jackfruit is that when it’s “young,” “green,” or unripe, it has an entirely different consistency and usage than when it’s ripe. Ripe jackfruit is eaten like any fresh fruit — the only difference is that it’s an extremely large fruit. An average jackfruit weighs between 30 and 50 pounds. Once you cut through the thick, green coral reef-like skin, you’ll find a creamy white interior filled with fibrous fruit and large pits. The flavor of ripe jackfruit is sweet and it’s typically eaten raw or as part of a dessert. My friend Loc is from Vietnam and he buys 2-pound sections of it for $15 in Manhattan’s Chinatown. After chilling it in the fridge, he then cuts out the seeds with a sharp paring knife (this takes some effort) and eats it in large quarters. It’s still easiest to find whole jackfruit in speciality Asian food markets, but the fruit is making its way into big grocery stores, too. Young, unripe jackfruit can be found canned and also in pouches in the refrigerated section of the grocery store. This is the type that is gaining a lot of attention as a meat alternative. It can be used in tacos, burritos, curries, bowls and stir-fries. And what about buying a whole green jackfruit? If you can even find one, it will be filled with a sticky white resin that stains whatever it gets on. But if you’re a total DIYer — go for it! Just know that you’ve been warned. Young jackfruit is generally packed with some water, and sometimes also salt, so give it a good rinse with cold water and let it drain in a colander before using it in recipes. Then you can literally do anything with it. It works especially well with bold and spicy flavors. Add it to chilis and stews, or sauté it with onions and peppers and throw it in a pita with some za’atar. Rub it with a Mexican spice blend, sear it in a pan and then wrap it up with brown rice and avocado for a filling burrito. For own barbecued jackfruit recipe, I used Upton’s Naturals’ original jackfruit, which you’ll find in the refrigerated section of stores like Wegmans and Whole Foods Market. True story: I’m not a fan of tricking kids into eating things that are healthier for them (I’d rather have them learn about and appreciate healthy ingredients naturally) — but I wanted to see if jackfruit would trigger the “ick alarm” for kids, so I served this to my son, who just happens to love meat. He gobbled up one half of the sandwich without even asking what kind of meat it was and then asked for another. Bring on the jackfruit! Frances Largeman-Roth, RD, is a nutrition expert, writer and best-selling author. Her books include Feed the Belly, The CarbLovers Diet and Eating in Color. Follow her @FrancesLRothRD and check out her website franceslargemanroth.com. This story was originally published Jan. 11, 2017.